Was there snooker on those last three day? Just a bit! On 10 and 11 April we had the WSS ROKiT Seffield Masters 2019 at the Crucible theatre. This event is part of the “Seniors Tour” and was won by Joe Johnson. Everyone was happy for Joe after what happened last year. Indeed during the launch dinner last year, Joe collapsed and if it wasn’t for the prompt and competent care he received from the medics, he wouldn’t be with us today, let alone a tournament winner. All the results and pictures are available here. A very important announcement was made during the event: the WSS ROKiT World Championship 2019 will be held at the Crucible Theatre from August 15 to August 18, 2019 and the Crucible will become home of the WSS World Championship for the years to come. Aside from the main competition, this event will also have sessions featuring Women Snooker players and Disability Snooker players. Not to be missed! Yesterday, 12 April, Ronnie did an exhibition in Mansfield. The day before he had come on twitter and Instagram, saying that he was practicing and “at it” again. Well apparently being “at it” meant this: heavy scoring. Indeed in nine frames, Ronnie had six centuries, the top one a 134, and two 90+ breaks. He must have had a lapse of concentration somewhere … 6+2=8 ? Apparently Ronnie and Jason are working on new merchandise items celebrating the 1000 centuries. The second item has all the dates on it… but they have a slight problem: counting the centuries, based on Ronnie’s list, the 134 he made to win in Preston was in fact century n°1001! Where is the rogue one? This illustrates an issue all statisticians of the sport have: in early days, nobody was keeping proper, well documented stats. Cuetracker.net for instance, credits Ronnie with less centuries than the official body does because Ron Florax, being extremely thorough, only accepts the centuries he can properly document, and information is hard to find for some older events, in particular team events like the Nations Cups for instance. Also some events, although sanctioned by Worldsnooker were not played on tables that were certified to comply with the governing body competitions standards, therefore those centuries made in them shouldn’t be counted. This was the case for the “Kilkenny Master” in 2007, an event that Ronnie won, and where he made a 147, but that doesn’t count in his official tally of maximum breaks. Finally the World Championships 2019 qualifiers are underway at the English Institute of Sport. This isn’t too bad for Ronnie. He doesn’t start right away, and still has a couple of days before his second match, should he win. What can’t be avoided are the two successive sessions in the QF if we get that far. Being second seed, he’s in the bottom quarter of the draw and that means the the two last sessions of his (potential) QF will be the last two of the round. and tomorrow I will try to travel to Sheffield, hoping that some hard Brexiters won’t tie themselves on the tracks to prevent the Eurostar to reach London and to stop it bringing it’s load of those terrible foreigners on UK soil … you know. I’ll be there primarily for two events: the WSS ROKiT Masters 2019, on April 11, which I’ll cover photographically – and the World Championship 2019 Qualifiers of which I will just be a spectator. If it can be arranged I might go to Ronnie’s exhibition in Mansfield on April 12, and that would be with my camera. The World Championship Qualifiers is a quite unique event. Players have to win three best of 19 matches to make it to the television stages of the World Championship at the Crucible. There is a lot of money at stakes. This is the place where careers end … or dreams come true. And this year there are quite a number of older pros – men we he seen on our screens for many many years – for whom this could be the last event. Amongst them, Jimmy White, Peter Ebdon, Robin Hull, Joe Swail, Rory McLeod, Nigel Bond, Peter Lines and Anthony Hamilton. There are 128 players at the event, arranged in 16 groups of 8, each group producing just one happy guy or gal who will play at the “Theatre of Dreams” in less than two weeks time. From this group, I expect the winner to be Ryan Day, Tian Pengfei or Matthew Stevens, although Chris Wakelin can’t be dismissed completely. Ryan Day is the unlucky bloke who finished ranked 17 at the end of last week. He will be desperate to get through. He has the game to do it. His temperament is far better than it used to be too. For me he’s the group favourite. Tian however is a very dangerous player; on a good day he can beat anyone. Matthew Stevens always had the talent and form has also improved recently. They both could spoil Day’s … day. Liang Wenbo has been under the radars for a while, but last week he reached the last 16 in Beijing and was playing well. Gary Wilson is always dangerous, but his form isn’t too great and Liang Wenbo is the man who beat him in round one last week in China. One man who could create a surprise is David Grace. He’s now an amateur, but was runner-up to the Challenge Tour, and, with it, got a new tour card. David is on form and one of the very few coming here with no pressure. That’s a dangerous combination. I still think that Liang Wenbo will emerge the winner of this group. However, I see David Grace as second favourite and he would be a very popular qualifier if he managed it! 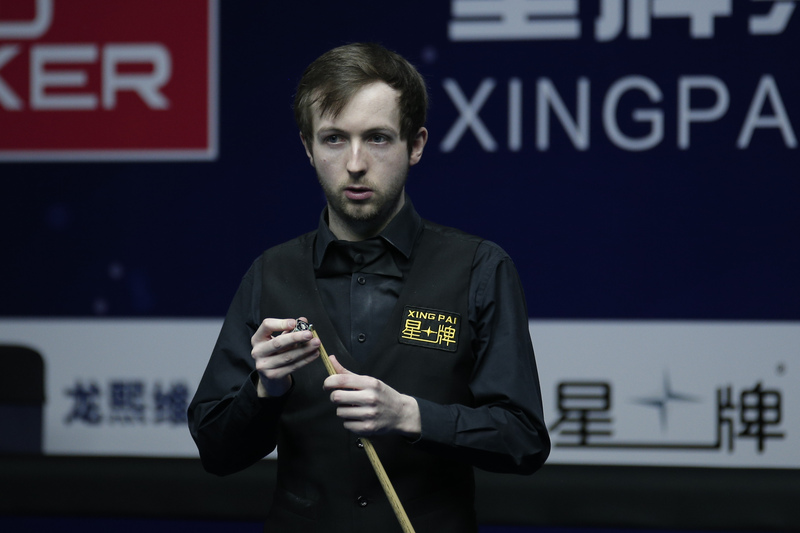 Sam Craigie last week in Beijing beat Ryan Day, Ali Carter and Liang Wenbo before being whitewashed by the eventual champion Neil Robertson. For me he’s the man to beat in this group, if tiredness from his recent exploits in China doesn’t spoil it for him. Marco Fu has been very inconsistent since being affected by eyes problems, Tom Ford’s temperament is a bit suspect under pressure. Robbie Williams? Yes, he beat Judd Trump in China and he’s the only one I can see challenging Sam Craigie here. I’ll stick with Sam. I would love to see Sunny Akani at the Crucible but I can’t see it happening. This group, in my opinion will be between Anthony McGill and Robert Milkins and I can’t decide which one. Robert Milkins has all the talent in the world but at times you’d think he’s been created by Adam Douglas’ Finite Improbability device as he throws out the most unexpected mistakes … His current ranking is 41, but really it should be 42. I think that Anthony McGill will come out the winner of this group. Expect some hard-fought matches in this one with Graeme Dott, Stuart Carrington and Mitchell Mann. Mitchell last year forfeited his match against Ryan Day in round 2, feeling unable to continue due to mental health issues. This also meant that he lost his professional status there and then. He seems to be in a better place now, he comes here as an amateur and has done very well in the Challenge Tour. I see him as a serious contender. But over three best of 19 distance, IMO Graeme Dott will prevail in this group. Kurt Maflin has been far too inconsistent all season for me to take him in the picture. There are two amateurs in this group: Aaron Hill, who is the under-18 European Champion and Mostafa Dorgham … who I had never heard of until a couple of days ago. I would be very surprised if any of them survived their first match, Aaron mainly because his inexperience in such environment. Jamie Clarke’s season has been dreadful, Zhang Anda’s too. So the highest ranked players should prevail easily in all four matches here. From there, I think that Hossein Vafaei is the one with the best form currently and I’ll go for him to win this group. I can see only one winner in this group, Yan Bingtao, despite a very quiet season. Mei Xiwen is a decent professional but without genius and vulnerable when matches reach the latter stages. As much as I’d like to see one of the “Europeans” – Lukas Kleckers and Florian Nuessle – win, somehow that looks highly improbable. Michael Georgiou has done nothing of note since winning the Shoot Out in 2018, Peter Ebdon is always hard to beat but isn’t winning much, Lee Walker could win his first match but will probably exhaust himself – and everyone else – doing so and Harvey Chandler always seems to come just short of victory – he ran Mark Williams very close in Beijing – but I DO hope he gets at least one win here. In this group as well we have two amateurs: the young Ross Bulman, the European under-21 runner-up and the veteran Andy Hicks. In the form Michael White is currently, I actually expect Andy Hicks to reach the second round. Jimmy White will probably have too much experience for young Ross. But the winner of this group should be either Ali Carter or Yuan Sijun. Ali has to be the favourite but I would absolutely love for Yuan Sijun to make it through to the Crucible. The only amateur in this group, David Lilley, who played in the WSS tour this season, as well as in the Challenge Tour and as a top up in the main tour could cause some problems to Eden Sharav, whose season hasn’t been great, although over best of 19 it remains to be seen if David can sustain the desired consistency. Robin Hull has some health issues and got almost no hope. Neither Liam Highfield, nor Hammad Miah have impressed this season. Alfie Burden hasn’t won a match in months. Ricky Walden is slowly improving but remains inconsistent. That leaves us with Zhou Yuelong … provided his temperament doesn’t let him down. Fergal O’Brien has all the attributes to frustrate young Jakson Page, and unless the latter outpots him, he will do just that. I expect Rod Lawler, who beat Kyren Wilson in Beijing, to beat Mark Davis who had an indifferent season. If my feelings materialise, we will have a Fergal O’Brien v Rod Lawler round two match. They better foresee two refrerees for that one: it could be an all day affair followed by an all nighter! I believe that Lyu Haotian is the more likely to come through the other half. And I think he can win the group too … given that he will probably be the freshest man standing in the last round. Jonathan Bagley, the only amateur in the group, is the WSS current n°1. He’s a very useful player but I doubt that he will have the scoring power to beat “Theppy”. Thepchaya Un-Nooh is the favourite to win this group in my eyes. I can’t see either Mark Joyce nor Billy Castle to cause him problems. I expect him to face Joe O’Connor in round 3. Jimmy Robertson has done very little since winning the European Masters in Lommel in autumn. Joe Swail is struggling. This is a hard group to call. Neither Andrew Higginson, nor Xiao Guodong have been in great form, or consistent recently. Both Jak Jones and James Cahill – now an amateur – have played well in spells during the season and could well cause an early “upset”. Peter Lines is always hard to beat, despite not always scoring very heavily but Michael Judge is no push-over. This match is 50/50. The most likely winner in this section, for me, is Michael Holt. He’s first up against Brandon Sargeant, who won the Challenge Tour 2018/19. It could be close though. Now this is an interesting group. It features two WSS players in Igor Figueiredo, the Pan American Champion and Ken Doherty. Igor is a very heavy scorer when on form. He will play Mark King, who isn’t that much of a scorer but a very hard match player. I’m not sure who will win this match, it will be very much on Igor’s form on the day. The winner will face Lu Ning or Alan Taylor. Lu Ning is unspectacular but has got a few good results this season. Again it’s hard to call. However, overall I think that Mark King will be the one to reach round 3. The other half features Ken Doherty who faces Andy Lee first. I would be shocked if Ken doesn’t win that one. Should he do that, he would almost certainly regain his professional status next season. The other match though is extremely difficult to predict: both Craig Steadman – who beat Mark Selby in Beijing – and Scott Donaldson – who reached the semi finals last week – are in good form. Scott is the better player in my opinion, but he’s likely to still be a bit tired from his run in China. Whoever goes through will offer Ken Doherty a strong opposition. But Ken is burning with desire to play at the Crucible one more time and I think he’ll prevail. Can he then beat Mark King? I’m not sure. Anthony Hamilton is struggling and I’m not sure that James Wattana – who remains a beautifull player to watch – has the stamina for a best of 19. James though did beat Ding in China last week, and did beat him soundly!. Matthew Selt and Zhao Xintong both face amateurs and should win their first matches. Adam Stefanow has shown signs of improvement in recent weeks, but Noppon Seangkham will probably have too much for him. The winner of this group should come from the trio: Zhao Xintong, Matthew Selt or Noppon Saengkham. Which one of them? I can’t decide. I can honestly see only one winner in this group and that’s Joe Perry. On Yee has been heavily defeated in her previous outings at the WC qualifiers and can’t see her beating Alan McManus over a best of 19. I could be close though and a very long match. Whoever wins will faced either the out-of-form Martin O’Donnell or the error prone Adam Duffy. Reanne Evans – provided she’s in good nick – could beat Zhang Yong, but I can’t see her get the better of Perry. The way Jack Lisowski had played against Stuart Bingham, I was expecting a rather close final, but this wasn’t one! 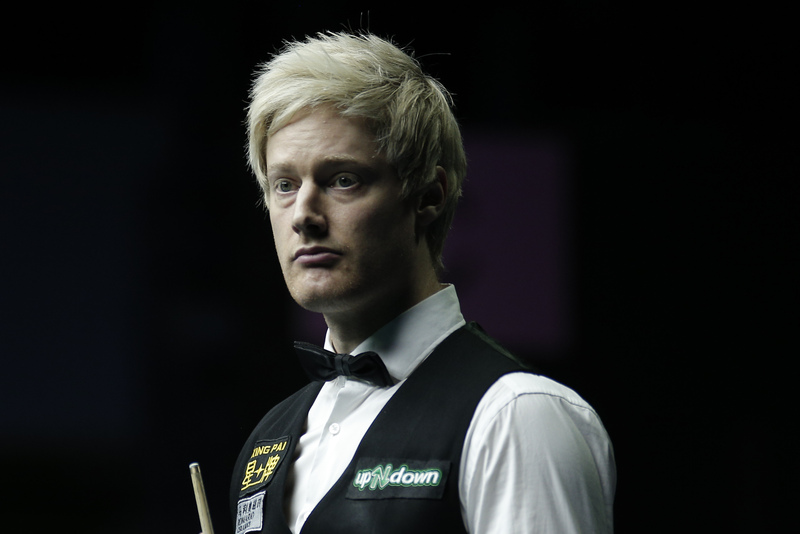 Neil Robertson dominated the match from start to finish and won by 11-4. He’s your China Open 2019 Champion. 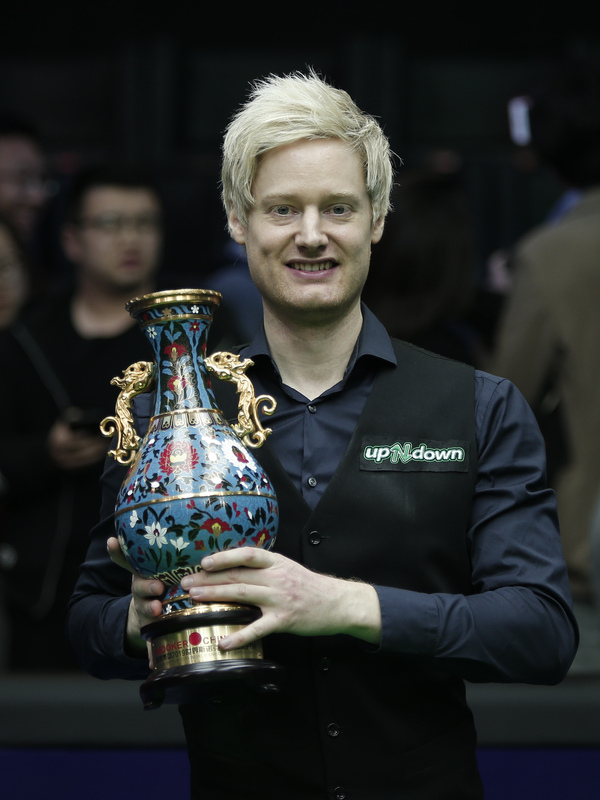 Neil Robertson claimed his second XingPai China Open title by defeating Jack Lisowski 11-4 in the final in Beijing. The victory marks the 16th ranking title of Robertson’s career and moves him clear of Mark Selby to occupy sixth position alone in the all-time ranking event winner’s list. The Australian picks up £225,000 for his win and that sees him boosted from seventh to fourth position in the world rankings. That means he will now be in the top half of the draw for this month’s World Championship. His total prize-money for the season has now passed the £500,000 mark. Robertson will head to the Crucible in a red hot streak of form, having now appeared in four consecutive ranking finals. He won the Welsh Open and was runner-up to Ronnie O’Sullivan at the Players Championship and the Tour Championship. It’s the first time Robertson has secured three ranking titles in a single season, having also won the Riga Masters earlier in the campaign. Lisowski will be disappointed not to have picked up a maiden ranking title. However, he has the consolation of the £90,000 runner-up prize, which is the biggest payday of his career. The Englishman’s performance this week has confirmed his place in the top 16 for the World Championship and he will now compete at the Crucible as a seed for the first time. Robertson had established a dominant position after the opening session today, moving 8-2 in front after the first ten frames. When they came out this evening, he immediately moved to the verge of victory with runs of 91 and 50 to go 10-2 up. Lisowski refused to fall away and claimed two on the bounce to provide some resistance and take the match to the mid-session interval. However, Robertson quickly snuffed out any comeback hopes for Lisowski, with a break of 79 to seal the 11-4 victory. “I was very determined going into today. I’ve lost my last two finals and with this being my sixth final of the season, I didn’t want it to be two wins and four losses,” said Robertson. “Playing someone like Jack Lisowski meant I had to play really well. When you know you have to play well to win, it gives you so much motivation. I was really concentrated throughout. It was probably one of my best ever performances from start to finish in an event. Especially in China, when you have to adapt to the jetlag. Afterwards Lisowski was keen to take the positives from this week and is now looking ahead to the upcoming World Championship. He said: “I’ve got to learn from this week and think about what happened. Neil played great today and I wasn’t that good. I can still see there are a lot of places with room for improvement. I have to knuckle down, as I could see my game getting better throughout the week. The draw now looks a bit more balanced than it was at the start of the week. With Stuart Bingham and Neil Robertson in his quarter, John Higgins certainly hasn’t the “easiest quarter” anymore. Arguably, the easiest quarter is now Mark William’s quarter, although Barry Hawkins is a bit of a Crucible specialist and always seems to find form in those long matches. Mark Selby will need to find something to contain the mad potters, Luca Brecel and Jack Lisowski. Albeit, regarding Jack, he still needs to prove that he can find his game on the biggest scenes against top opponents. Obviously Ronnie and Judd Trump possible QF clash isn’t an easy prospect for either of them. Exactly as I expected we have two members of the top 16 in the Final tomorrow, despite all the early exits at the start of the week. The two semi-finals couldn’t have been more different. Jack Lisowki completely outplayed Scott Donaldson and raced to an emphatic 10-1 win. 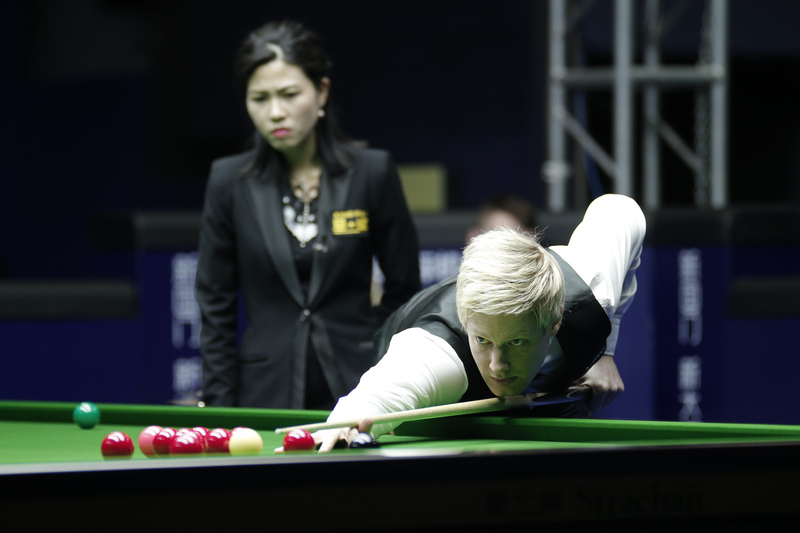 Neil Robertson eventually beat Luca Brecel by 10-7 but the match stayed very close up to 7-7. Luca had a great opportunity to go 9-8. An unexpected miss and then a safety error cost him a chance to stay in the match. Neil was the more solid of the two mentally and that made the difference eventually. 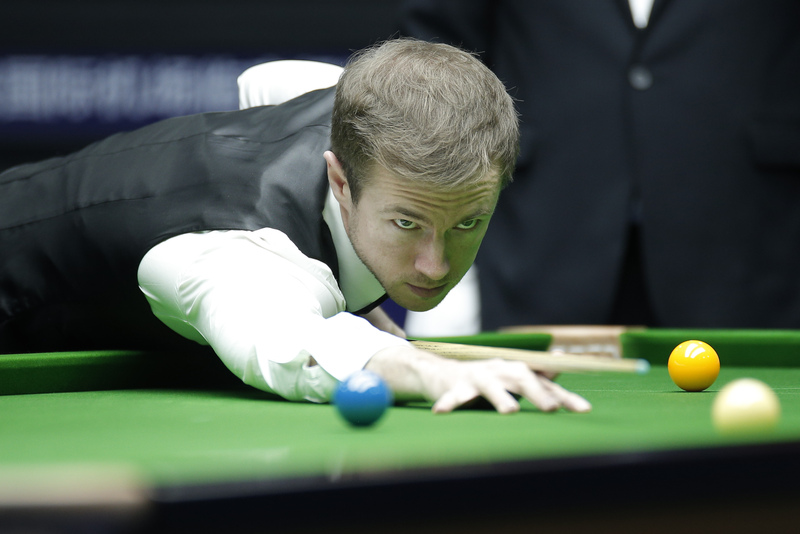 Jack Lisowski is just two frames away from reaching the second ranking event final of his career, leading Scott Donaldson 8-1 going into the second session of their XingPai China Open semi-final in Beijing. Lisowski appeared in his maiden ranking final at the season opening Riga Masters, losing out to Neil Robertson. The Englishman followed that performance up with several strong showings to secure his place in the world’s top 16 and ensure qualification for this month’s World Championship at the Crucible. Scotland’s Donaldson is the only remaining threat to David Gilbert in the Race to the Crucible. Gilbert currently occupies 16th position and is now looking to be close to safety, with world number 52 Donaldson needing to win the event to leapfrog him. Lisowski put on a supreme display in the opening session to secure his hefty advantage, firing in century runs of 114 and 136 on his way to establishing the 8-1 scoreline. Neil Robertson came from behind to secure a slender 5-4 lead heading into the evening session against Luca Brecel, in what has been a high quality encounter. The Thunder from Down Under is aiming for his fourth consecutive appearance in a ranking event final, having won the Welsh Open and been runner-up to Ronnie O’Sullivan at the Players Championship and Tour Championship. World number 14 Brecel, who is assured of a Crucible place, claimed the opening frame with a break of 70. Robertson levelled immediately, but the Belgian went on to take two on the bounce and lead 3-1 at the mid-session. When they returned Robertson ramped up the level of play, with a break of 135 to cut his deficit in half. Brecel hit back with a century contribution of his own, a run of 116. However, consecutive breaks of 94, 98 and 52 saw Australia’s Robertson take three in a row to lead 5-4 heading into tonight. Neil Robertson continued a red hot run of form to secure his place in the XingPai China Open final with a hard fought 10-7 defeat of Luca Brecel. Robertson will face Jack Lisowski in tomorrow’s final over the best of 21 frames with a top prize of £225,000 up for grabs. The match will be a repeat of the final at the season opening Riga Masters, where Robertson came through a 5-2 victor. The Australian has now appeared in four consecutive ranking finals, having won the Welsh Open and been runner-up at the Players Championship and Tour Championship. If Robertson were to win in tomorrow’s final he would take his earnings for the season above £500,000. Victory would also see the 2010 World Champion move from seventh to fourth position in the world rankings. Former China Championship winner Brecel will leave Beijing with the consolation of £45,000, having reached his first semi-final of the campaign. This week’s run has confirmed his place in the world’s top 16 in the Race to the Crucible. The pair came into the evening session with just one frame between them, after Robertson edged a narrow 5-4 lead this afternoon. 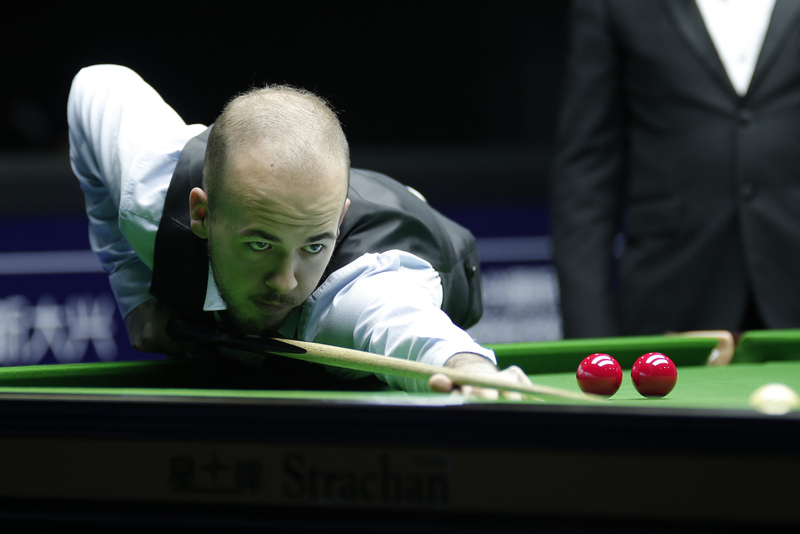 It was Brecel who started the brightest tonight. He claimed the opening frame with a break of 85, before taking the next to move 6-5 in front. The match then swung back the way of Robertson, who fired in breaks of 56 and 65 to lead 7-6. Belgium’s Brecel levelled at 7-7, but Robertson upped his game as the finishing line came into sight. The 15-time ranking event winner composed runs of 73, 83 and 66 to claim three in a row and secure the 10-7 victory. Robertson said: “I think Luca played an amazing match. If he was against anyone but myself, Judd or Ronnie he would probably have won today. Huge credit to him. I did well in the first session to get the lead from behind. I kept believing and kept trying even though I’m really tired. This is my fourth final in a row, which is crazy. I’ve been playing snooker non-stop recently. “I’ve played a lot of snooker the last four or five weeks. The last couple of tournaments have been long distance matches, but I guess that is getting me ready for the World Championship. Lisowski progressed courtesy of a 10-1 demolition of Scotland’s Scott Donaldson. He has enjoyed a fine season and appeared in the Masters for the first time earlier this year. The Englishman has maintained his position in the world’s top 16 and will compete as a seed at the Crucible for the first time later this month. Defeat for Donaldson means that he misses out on the chance to pip David Gilbert to the last remaining spot in the world’s top 16 for the World Championship. Donaldson will now have to head to qualifying next week to attempt to secure his place. Lisowski had already established an imposing 8-1 advantage after a sparkling display in the opening session. He made light work of finishing the tie off this evening, reeling off the two required frames in under half an hour to book his place in the final. “It was a great day for me. I managed to get on top of Scott from the first frame. I just stayed on top the whole game. He didn’t have a lot of run, but he is a great player and is really improving. Both of us are quite new to this. I just managed to keep my head down,” said Lisowski. “I feel like I’m dealing with situations much better than I was at the start of the year. This season has been a learning curve for me. I’ve had some tough defeats, but I think I’m on top of things now. Tomorrow the final will be played over a possible 21 frames, first to 11. Given how their past encounters went, records and experience, Neil Robertson must be the favourite. However, I would be very surprised if it was a one-sided match this time. These results mean that the seeds at the Crucible are now known, although the “seeded” draw can still change. Whatever happens tomorrow there is a rather strong possibility of a Ronnie v Judd Trump clash in the QF. Ronnie will also work with Eurosport during the World Championship and, actually, I think this could help him. Often in the past he has struggled with the length of the tournament, not so much the matches, but the “idle” time in-between. There is only so much practice you can do. Being kept busy, doing something he loves, with people he loves, might actually prevent him to “over-think” about the matches to come and keep him safe from boredom and home-sickness. It was quarter finals day in Beijing. The afternoon session saw two matches ending with very one-sided scores. Neil Robertson whitewashed Sam Craigie and Luca Brecel only allowed Alan McManus a single frame. I did not watch any of the latter and, judging by the report below, it was really one-sided. Luca DID out-pot Alan. I watched the other match though and that one was much closer than the scores suggests. 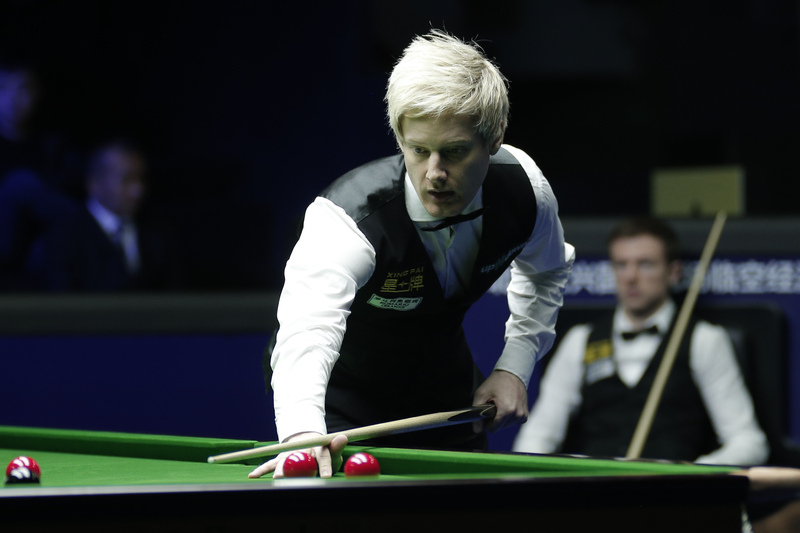 Neil Robertson did make mistakes, but Sam Craigie was unable to take advantage. Sam really struggled with pots over distance. After the match Neil said that the table was playing “strangely” and that the conditions were really difficult. He suggested that having played on this same table in the previous days had given him an advantage of sorts because he was prepared for those conditions, whilst Sam had never been on that table until today. Neil WAS the better player, no doubt, but a score of 6-3 would probably have been a fairer reflection of what happened at the table. Stuart Bingham was never in front in his hard-fought match against Jack Lisowski. However when he came back from 5-3 down to force a decider and then was in early with a relatively open table, I thought that Jack had lost this match from in front … again. But not so. A positional error from Bingham led to a last chance for Jack. It wasn’t a promising table at all, but he managed to win the final black. This is a new, more mature Jack that were are seeing. 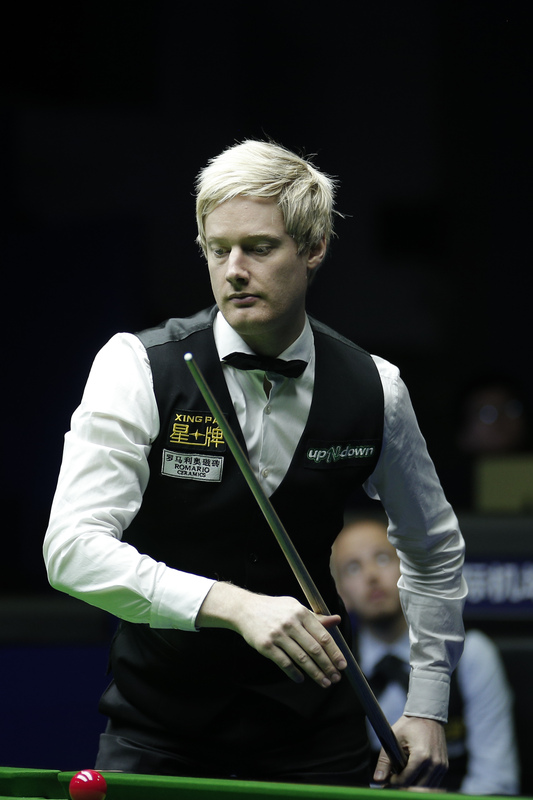 Neil Robertson recorded his second successive whitewash victory to defeat Sam Craigie 6-0 and progress to the semi-finals of the XingPai China Open in Beijing. The win comes one day on from Robertson’s 6-0 last 16 demolition of Lu Ning and the Australian has only dropped five frames so far this week in Beijing. The world number seven is one of the form players on the World Snooker Tour. He’s the highest ranked player left in this week’s event and is aiming to reach a fourth consecutive final, having won the Welsh Open in February and been runner-up to Ronnie O’Sullivan at the Players Championship and Tour Championship. Robertson also won the season opening Riga Masters last July. The Thunder from Down Under will face Luca Brecel in the semis on Saturday over the best of 19 frames. The stakes are high, with the tournament winner’s prize money standing at £225,000. 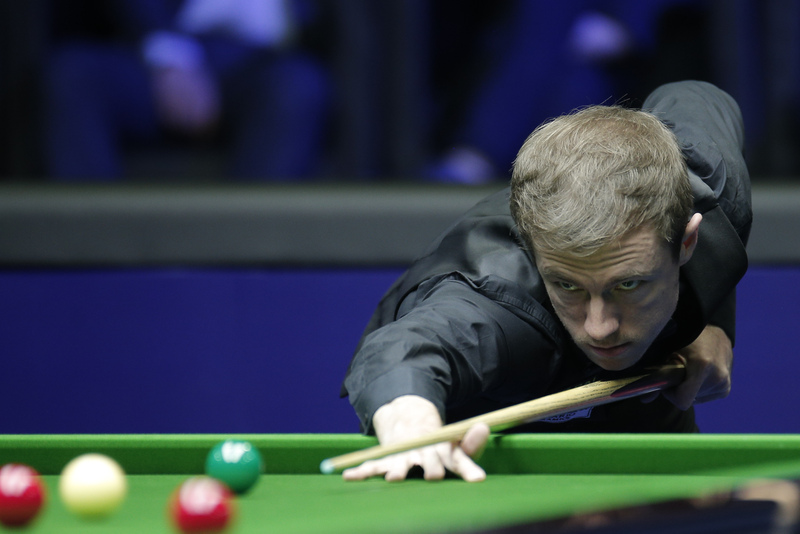 Although the overall result today was a one-sided one, Robertson was made to work in the early stages, taking the first two frames on the colours. A break of 80 then helped the 15-time ranking event winner into a 3-0 lead. Robertson showed further battling qualities to claim a 44-minute fourth frame, before breaks of 52 and 115 helped him secure the whitewash victory. Brecel sealed his place in the semis with an equally impressive victory, defeating 1994 Masters champion Alan McManus 6-1. The Belgian’s performance this week has secured his place in the world’s top 16 and as a result, qualification for the World Championship. Such is the extent of the prize money on offer this week, world number 60 McManus could have edged into a Crucible spot by lifting the trophy on Sunday. He will now need to gain his place at the qualifiers next week. Now 16th placed David Gilbert can only be caught if Scott Donaldson or Ben Woollaston claim the title. They face each other later on today . Brecel showcased his break building power today to surge to the win. He produced a sublime run of 139 to take the opening frame. McManus hit back to level in the second, but from there Brecel didn’t look back. The Belgian Bullet fired in consecutive contributions of 130, 108, 59, 66 and 95 to secure an impressive win and set up a mouth watering semi-final meeting with Robertson. 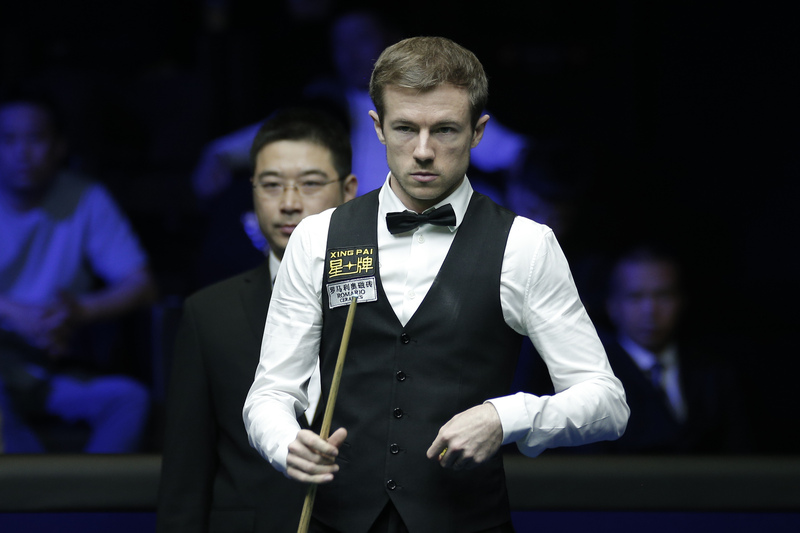 Jack Lisowski held off a Stuart Bingham fightback to clinch an exhilarating win 6-5 in their quarter-final meeting at the XingPai China Open in Beijing. Lisowski was playing with a new tip today, after requiring a replacement during his narrow victory over Li Hang in the previous round. He now faces Scotland’s Scott Donaldson over 19 frames tomorrow, for a place in the final and a chance to compete for the £225,000 top prize. 27-year-old Lisowski, who made his Masters debut earlier this year, will compete as a seed at the Crucible for the first time later this month, after securing his place in the world’s top 16 ahead of the World Championship. 2015 World Champion Bingham leaves Beijing with the consolation of having made the fifth 147 break of his career earlier in the week. Bingham stands in line to pocket a £27,000 payout if nobody makes another before the end of the event. Lisowski asserted himself on today’s tie from the off. Breaks of 93 and 108 helped him to move 3-0 ahead in the early stages. Bingham responded with a fine contribution of 118 to stay in touch at the mid-session and make it 3-1. They traded frames, as Lisowski maintained his two-frame cushion at 4-2. Bingham then snatched a dramatic 45-minute seventh frame on the black, before Lisowski compiled a break of 74 to move one from victory at 5-3. After taking the ninth frame, Bingham forced a decider with a superb century run of 108. The final frame provided plenty of drama. Lisowski was first in after a loose break off from Bingham. However, he missed a red to middle on 14 to allow Bingham his first opportunity to clinch the tie. The six-time ranking event winner had looked to be on course to seal a comeback victory, before breaking down on 57. Lisowski pounced with a superb clearance of 52 to take the match on the final black and reach the fourth ranking semi-final of his career. Lisowski said: “It was an amazing break to win at the end. I don’t know how I did it. I felt quite nervous in the last frame, but the way Stuart was looking I just thought if I get one chance then go for it. It was a great feeling. Donaldson, who will be competing his fifth ranking semi-final tomorrow, booked his place in the last four with a hard fought 6-4 win over Ben Woollaston. The Scot is now the only remaining threat to David Gilbert’s top 16 place in the Race to the Crucible. Donaldson, currently ranked 52nd in the world, would have to win the event to overtake Gilbert. The Perth potter clinched his quarter-final victory in style with a sublime break of 130 to cross the line in the tenth frame.